September 30, 2015 - "Press Releases"
Tucked away in a nondescript office park along Snowdrift Road in Upper Macungie Township is the North American headquarters of a global industry leader few locals know much about. And one that has expansion plans throughout the nation. About 65 employees work at the site, designing and manufacturing conveyor systems that accumulate, elevate, divert, flip, tilt and merge – sometimes at dizzying speeds – everything from test tubes to solar panels during the manufacturing process. “We tend to get into complicated solutions,” he said with a smile. Say, for example, you are a manufacturer that has limited floor space but needs to increase production without expanding your building. Using one of its relatively simple but customizable systems, FlexLink engineers will design a conveyor solution that takes into account unused space above the floor, leaving plenty of room for fork trucks and people to move freely while products whiz by overhead. In industry parlance, FlexLink is a logistics supplier – providing material and information flow-management solutions to assembly and manufacturing industries. It specializes in automated plastic chain conveyor systems and wide belt conveyors, including aluminum conveyors and stainless steel conveyors. In simpler terms, FlexLink provides manufacturing automation, serving a wide customer base from local producers to global corporations and from end-users to machine manufacturers. It has more than 8,000 installations worldwide, many for leading brands within the automotive, electronics, food and beverage, medical device, optical, personal/consumer/health and beauty product and pharmaceutical industries. It might help to understand what FlexLink does not do. It doesn't transport raw goods and it doesn't provide miles of conveyor belts for warehouse and distribution applications, although that would make it popular in the Lehigh Valley. Typical projects can run from $10,000-$15,000 up to several million dollars that can take up to 18 weeks to complete. Last year, the company handled 450 projects, according to Clark. In the pharmaceutical industry, for example, designs solutions are for filling, packaging and end of line for syringe, vial and ampoule products. In the food industry, the company has designed conveyor equipment with low noise levels and without sharp corners, edges, pinch points and heavy lifts that improves worker safety. It also protects food by preventing scratches and other damage, which keeps out bacteria, pathogens and other contaminants and lengthens the shelf life of the product. In the optical industry, FlexLink provides conveyors that automatically route trays containing the lens blanks to the blocking, polishing and beveling machines for processing that precisely follows the prescription instructions. This high level of automation, with 100 percent process-control, greatly reduces throughput time and breakage, which lowers overall costs. The company recently introduced a remote monitoring service that tracks the health of conveyors and predicts the need for maintenance. By being able to detect variations in speed, motor temperature and power consumption, the system can alert operators to potential problems and avoid unplanned production stops. FlexLink has operated in the area since 1978, starting as an in-house subsidiary of SKF, the Swedish maker of ball and roller bearings. Customers who visited the plant were so impressed by some of the innovative transport solutions it was using that they asked if SKF could develop similar systems for them, according to Clark. With demand for its products growing, SKF 10 years later established a separate facility for FlexLink operations in Hanover Township, Northampton County. 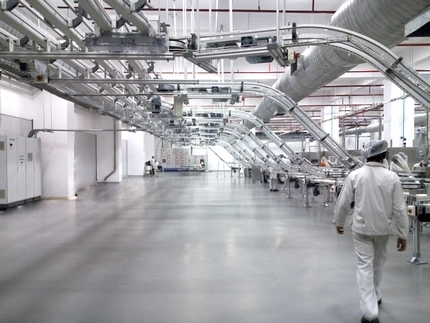 A group of private investors bought FlexLink in 1997 and moved its headquarters to its present home. Three years ago, FlexLink joined Coesia, a privately held group of innovation-based industrial solutions companies operating globally, headquartered in Bologna, Italy, and fully owned by Isabella Seràgnoli. Clark, who joined FlexLink in 1999, said becoming a part of a company with $1.6 billion in sales has been an asset. FlexLink has grown by about 10 percent annually the last five years, in part of because of synergy with other Coesia partners, he said. FlexLink also is always adding new products and expects to open new offices in the U.S. to supplement North American sales and service units in South Carolina (Greenville), Texas (Dallas), Wisconsin (Appleton), California (Cupertino), Toronto and Mexico City. Despite its low profile, FlexLink is “very much in the sweet spot” of employers that Don Cunningham, executive director of the Lehigh Valley Economic Development Corp., wants to see set up shop in the region. “We are fortunate to have them here,” Cunningham said.